There is a new product popular among artists and creators, a 3D pen. 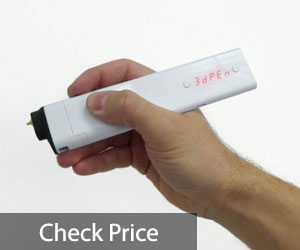 It is similar to an ordinary pen but is made differently and works like a hand-held 3D printer. A 3D pen is a bloated version of the regular pen which has plastic instead of the conventional ink for using it. Your head must be filling with questions like, why do we need it or what purpose would it serve, and other questions. There are numerous ways a 3D pen could be used given its key functional property; it can be used on any surface and with a touch of 3D! Yes, that is right. These pens do not require a paper like surface, or a special screen to be used on. It has the same design as an ordinary pen has, it requires the same movements as an ordinary pen does, only difference is that it is 3D. A 3D pen is filled with a plastic filament which goes into it through one end, unlike the regular pen which uses ink. Inside the pen, there is a heating element that heats up the plastic to form a hot liquid of plastic which can be used to draw, write, and do pretty much everything on any surface. Yup, that’s about it. Simple as that. Then again, what to do with it, right? Possibilities are endless. You could give another dimension to your paper artwork. Explain concepts with 3D which seem complicated in 2D on paper. It’s only been a little while since the launch of 3D pens the but the market has flooded with different styles and varieties of pens serving a plethora of purposes. For a person who is inexperienced, choosing the best out of many could be bothersome. 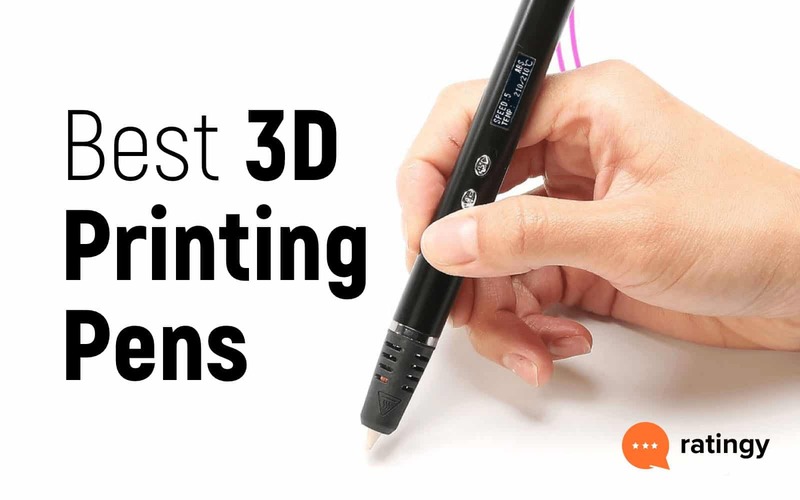 We have made a list of the best 3D pens in the market currently, so you don’t have to scratch your head and waste time on going through each one of them. But before we jump right into them, we’d like to mention a few things to consider before buying any 3D pen. Something like a Buyer’s guide. It is Better to choose a portable 3D pen. Exercise caution while using hot nozzle pen. The tip could burn surfaces and skin. Do not use any other plastic filaments other than the suggested one. It could harm the device. 1. 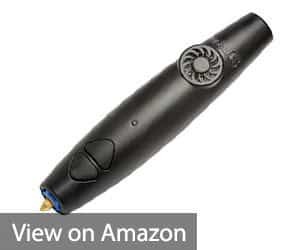 Type of control- Most 3D pens come with a temperature control system. You can control the temperature of the liquid plastic. Many allow us to control the speed of the flowing liquid for stable art pieces. Control boosts efficiency and accuracy and increases comfort of drawing. 2. Design– A steady hand and a steady device make the art cleaner and accurate. The ergonomic design of the pen offers just that. These pens are designed to fit perfectly in your hand and cause the least bit of discomfort. Small and portable, even a laptop could charge the battery of these pens. 3. Filament type- There are four types of filaments; Standard, Flexible, Composite, and Specialty. The type of filament used determines the strength and style of design. It allows us to hold the pen at different angles to get difficult corners or make intricate designs. 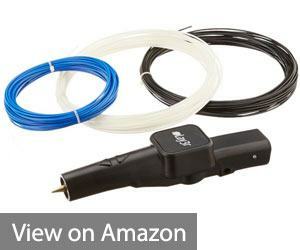 Filaments which can easily be replaced are far more convenient for use. They keep the pen usable for a long time. Wait..wait. Another thing. After the release of 3D pens, a new pen was launched which is known as Cool ink pen. It is also a 3D pen but the cool ink pen differs in a lot of ways than the conventional 3D pen. The main component which separates cool ink pen from the rest of the 3D pens is the cooling element. The pen uses photo-polymers(substances which react to light) that are cooled using a LED light. Cool, right? It is designed to increase the safety while using a 3D pen. Conventional 3D pens use a heater to melt plastic which when flows out is quite hot, which could potentially damage the skin if it comes in contact. Here is a List of The 10 Best 3d printing pens in Market. The 3D Simo, where to begin. This 3D pen is nothing like your average 3D pens. It is way ahead of the competition and started to grab a lot of attention. After the market had saturated with a plethora of 3D pens the 3D Simo didn’t want to be another book on the shelf. This amazingly beautiful pen not only allows us to draw in 3D but can also help in soldering, cutting, and even burning. All this with different attachments that come with the pen. All these features may not be much use to a kid but to a professional, it means a lot. To design and make intricate pieces, a pro requires every kind of tool at his disposal and the 3D Simo delivers exactly that. 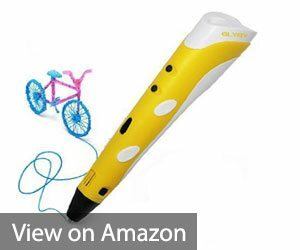 If you are Looking for a 3d pen for your kids,then you need to check 3d simo Basic 3d pen, which is best suited For kids. 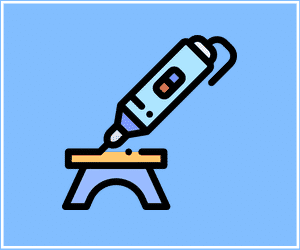 The body is a bit bulky, but it can be overlooked given the kind of technology required to combine soldering, cutting, and burning with 3D doodling. It has all the basic control functions like temperature and speed and is also suited for every type of filament in the market.That’s not all, it comes with its own material designed app, for both IOS and Android. You can watch tutorials, make designs, and do a whole lot of other cool stuff on the app. The best part, it comes with USB charging. Portable, 4-in-one features, cool mobile app, what more do you want? 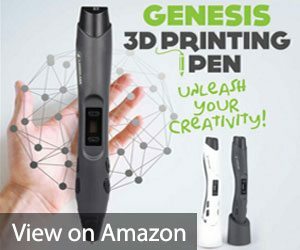 Genesis 3D pen is a Product of Lasso Labs with all round capabilities such as temperature control, speed control, etc. 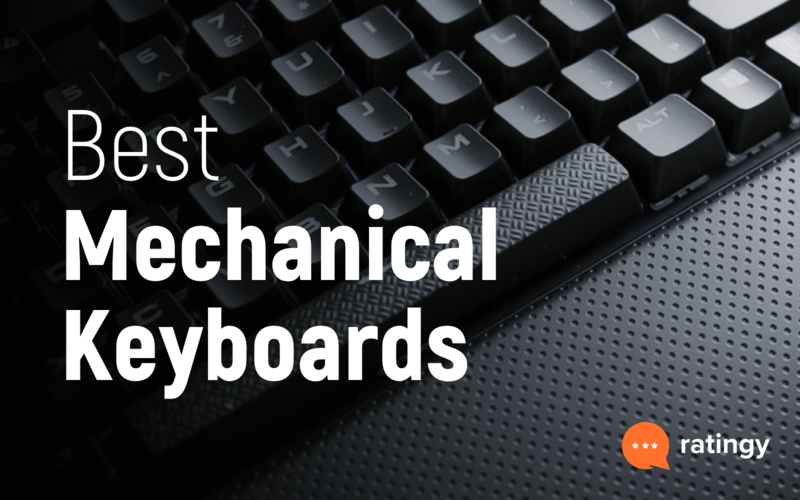 It’s durable and sturdy, and ease of usability is tremendous. It even holds a LED display to show the temperature and speed of the flow. It weighs exactly 1 pound and has dimensions of 7.9x5x3 inches. The packaging includes a special stand with a grip feature to hold it in position. Its modern contour design enables us to use it with extreme finesse to make accurate designs. The tip is designed such that enough air flow is maintained to cool the melted plastic. Again, downside of this pen is that it doesn’t have a universal charging system. Many customers are happy with the product and they should be because this is the leading product in the market. Its ergonomic design and smooth handling feature make this pen one of the most satisfying device to work with, and that is why it is at second position in our list. The pen comes with all the necessary accessories required to make any 3D creative piece. We’d recommend this pen to anyone who is starting out on 3D adventures. Although air flow is maintained, it does heat up sometimes when used for longer durations. 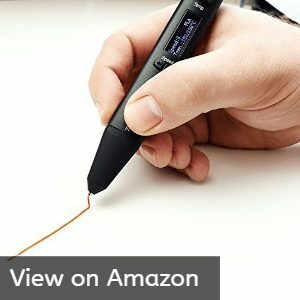 The 3Doodler is the world’s first 3D pen designed by WobbleWorks, Inc., a relatively new consumer electronics company. The pen has a compact body which is easy to use and weighs 1.2 pounds. It’s almost 7.5 inches long and fits perfectly like a pen in a hand. Its width varies with distance and does not have a tapered area to hold it. This proves to be a little bothersome but the rest of the features make up for the lack of an ergonomic design. Like most 3D pens this also does not come with a USB type charging port. It has two speeds to run at, fast and slow, also a reverse function. Two temperature settings to use with ABS and PLA refills. A multi color LED indicator to display various settings. Does not take much time to warm up, not more than a minute. Packaged box contains 50 strands of plastic with a variety of 10 different colors to choose from. According to popular opinion, it is extremely energy efficient and cools pretty rapidly but the tip heats up to high temperatures and should be kept away from children. The body is a little bulkier which seems to make it difficult to move easily. All in all, a nice pen for experienced people, a bit of a learning curve for the beginners. CreaoPop 3D is not like your ordinary 3D pens. This powerful device is the first of its kind. The pen is a cordless 3D pen, yes, no wires, which gives immense portability. Being a cool ink 3D pen, it does not have any heating element. It uses melted plastic without heating it. How cool can this get! In the above text, I had mentioned the difference between normal 3D pens and cool ink 3D pens. CreoPop 3D uses cool ink technology to cool the melted plastic using LED diodes. It is one of the Best Cool Ink 3d pen. The plastic is special as it is made up of photo-polymers which react to light. Other 3D pens use thermoplastic which reacts to heat. Given that there is no heating element, it is very easy to use and safe for children. Also, no filament is required as the plastic ink comes in cartridges. The makers are the only supplier of the ink cartridges reducing the availability of the plastic. It has control functions for speed, temperature, etc. Sleek design and compact body make this pen stand class apart from the rest of the pens in the market. As there is no power cord, it has a battery that can be charged using a USB cable. No hassle of dangling wires while you are working on your next masterpiece. Next in order is the Glyby 3D pen. This pen sure is a little funky looking but has a lot of potential. The Glyby 3D pen was designed for the needs of kids. If you’re sort of a professional the then this pen will disappoint you in terms of output. Its primary objective is to serve the 3D artists in the making, to get their hands dirty. It is packed with all the modern functions that’ll keep kids happy for a long time, under close supervision, of course. It weighs 12 ounces and is 8.5 inches long with a sleek build tapered enough to hold it like a regular pen. This pen works on most of the surfaces. Comes with an auto-shutoff feature, i.e., after 5 minutes of inactivity it automatically shuts off to avoid overheating of the plastic or the element. This is a corded pen which does not have any USB ports for charging, like many 3D pens. Reviewers have marked this pen as the most budgeted pen in the market. It doesn’t look that way but considering its functionality it is a powerful pen for kids to have unlimited fun with. There isn’t much to complain about this pen as it gives enough for the price it asks for. Another 3D pen that fights for the top spot. The MYNT3D pen is an all round 3D pen perfect for professionals and kids. This powerful pen comes with speed control to fill larger areas quickly and intricate designs delicately, temperature control to let any filament of plastic that melts between 130-240 degree Celsius work splendidly. This pen breaks barriers of using only proprietary filaments by letting itself work on any filament. Its ergonomic design lets you control the device with perfect maneuverability which many 3D pens fail to do. All this with the pinch of portability. It comes with battery power banks that can be charged using a USB charger. If the tip of the pen gets too hot and gets damaged, worry not, it can be replaced within a matter of minutes. The modular design makes this pen easily changeable, thus making it last longer than other pens. Its lightweight, 9.6 ounces body makes it a near perfect device for 3D crafts and designs. Not too heavy and not too light on the hands. 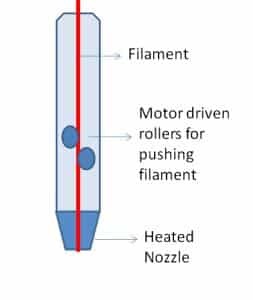 Many users have reported jamming of the flow area because of uneven heating of the filament but that only accounts for about 10% of the users. This is usually caused due to incorrect temperature settings and user error. All that and it comes with an OLED display. Other than that, everything works as smooth as butter. The Scribbler 3D V3 has been remodeled, redesigned, reconstructed over and over again to make it the perfect device for unleashing your creative side. It still goes under a lot of design changes and is continuously being improved. It comes with a standard USA Power adapter with no USB type charging capabilities, 3×1.75mm PLA filament in different colors to make designs more colorful. Its 4-inch long body with 2×6 inches width renders it superbly portable. With its weight on the lighter side, being only 6.4 ounces, the degree of control is incredible. People of all age groups can make use of this pen as it serves all equally. Professionals, amateurs, kids, everyone. Some people have reported the loss of motor function in pen after a while; the filament isn’t being automatically sucked in. This, however, is the case with many 3D pens. But it’s like we said, it is being perfected all year round. It comes with a handy user manual explaining all the inbuilt functions present on the pen so even a child of the age of 7 can understand. Ergonomic design, slim body, lightweight, it feels as if one is drawing with a regular pen. It has rechargeable batteries that can last very long, well, that depends on the type of work, but they are enough. 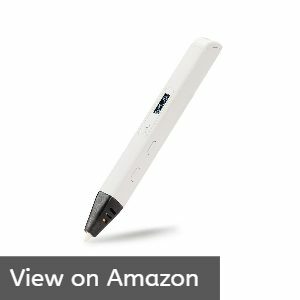 The AIO Robotics Premium 3D pen is probably the slimmest 3D pen in the market. For a pen of this size, it sure would surprise you what it packs in its slim body. It weighs approximately 14 ounces. Not too light and not too heavy. Just the right amount to let you move your hand with ease as if holding a bulky regular pen. A good thing about this pen is that it does not require proprietary filament, meaning that any grade of filament can be used as long as it is 1.75 mm in diameter. Its body is ergonomically designed, and it comes with a 5V DC, 2 Amp USB charger, very few have this capability. Having a USB Type charging port increases the likelihood of keeping the device always charged as most of our other devices have USB ports and many regular phone chargers also use USB. It even has temperature control with 1-degree increments. An extra-bright OLED display to monitor the flow speed and temperature of the plastic filament. The packaging includes 2 colors of PLA filament, a user manual, cable and a charger. A year’s manufacturing warranty if anything happens, and first timers who have bought this are quite happy with the results. No steep learning curve, charges quickly and an all round good 3D pen. 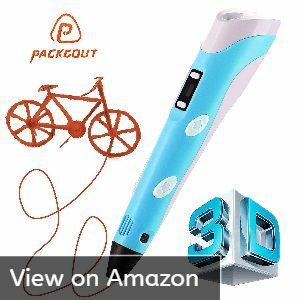 The PACKGOUT 3D pen is the second generation of its kind. Yes, the earlier model was a little disappointing, but the company upgraded their technology to achieve a better and simpler pen. It really paid off. This model is best suited for PLA. PLA is a type of environmentally friendly biodegradable material made from renewable plant resources. This filament when burnt will not produce odor and is far safer than the ABS filament. This pen is probably the lightest out of all its other competitors. Weighing only 2.2 ounces, this pen feels exactly like a regular pen and has a slim body to make designs easier. It is 7.2 inches long and 1.1×1.6 inches in girth. This most likely is best suited for kids than professionals. Comes with a 240V adapter, and sadly does not have USB capabilities. All of the 3D pen companies should consider having USB ports. It makes life so much easier. The pen takes the regular 1.75 mm filament and no other. Don’t know whether any filament would work or proprietary ones, but we’re inclined towards any because otherwise, it would make this device too restricting. 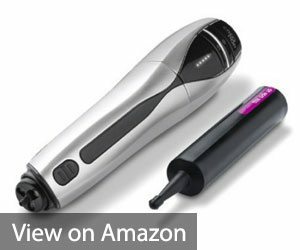 If you’re more of a professional then buying this for personal use would not benefit you, maybe gift it to a newbie. Not suitable for professional or heavy duty designs. A relatively new product from one of the best3D printing makers Lay3r, has dimensions of 5x1x1.2 inches, sturdy body weighing 1.1 pounds, perfect fit for all types of people. Extremely fun and easy to use to doodle, draw, etc. Kids can use it draw and learn all sorts of things. This pen uses 1.75 mm abs filament and also has a cooling fan. The plastic can also be used to fix broken pieces. The pen comes with an auto-shutoff feature to shut down automatically at any interval. 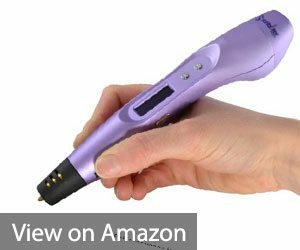 The Lay3r 3D pen is regarded as one of the best in the market currently due to its ease of use and smooth functionality. A downside of this pen is that it does not have a USB charger. It works on an adapter that is built specifically for it. But the build quality and ability to function on any surface make up for it. All in all, it is a great product for building creative stuff or repairing 3D models. Another disadvantage many would consider is that the tip is directly after the end of the structure, there is no tapered area to hold the pen. This might cause some discomfort. Phew. 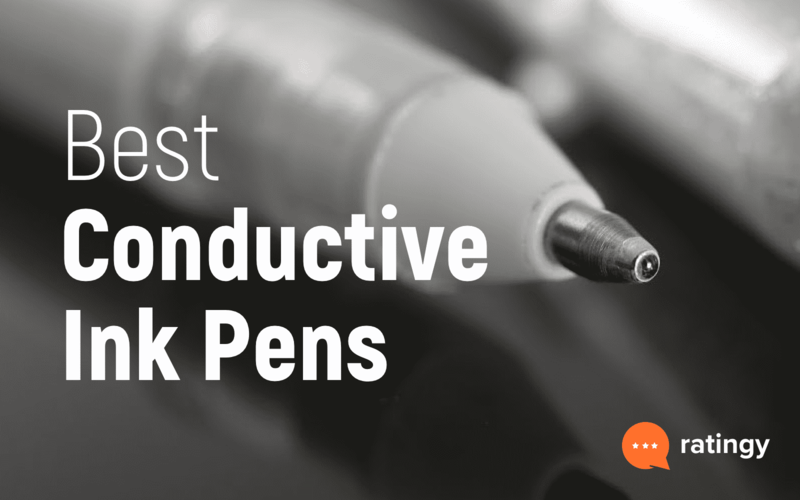 That list is long, but it has the 10 Best 3D printing pens on the market. If you’d search all the pens available in the market alone, 3D pens will become obsolete. You must be wondering why would anyone spend money on buying a 3D pen when one can easily purchase a 3D printer. Right, but a 3D printer is suited for large projects, and kids find it very difficult to operate, I mean, learn the software, design the parts, wait for the machine to have all the fun while making cool stuff. You see the point, right? 3D pens are more fun, and allow anyone to make anything anywhere. No steep learning curve, no design issues, just your imagination with a pen in hand. Currently, the market is growing, and many more changes will be seen in the future pens. Which means more of them will come out and crowd the market making it difficult for you to choose. That’s exactly why above list is created, to help people looking for 3D pens. If you Know Any other 3D pen that deserves a place in our Top 10 Best 3d printing pens comment below or contact us through the Contact from. I suggest you to go with either MYNT3d or 3d simo basic. These 2 3d pens are good for your 9 year old kid. Lix pen is good in terms of Design and Handling, but it got many negative reviews from various buyers, so i didnt listed it on my list. I suggest you to go with 3d simo Mini. I personally Tested 3d simo mini and it is the best 3d pen according to me. Hi tim. I would like to make Figure using 3D pen. What 3D pen is suitable? Hello kevin i would recommend 3d simo mini for all professional purposes. Hi, I just went through your top 10 3d pen recommendations and thinking to buy mynt 3d pen for my 8 year kid, will update here if everything is good with it.